At our AGM in April Merrill decided to stand down as President after five years’ service. Janice also stood down as our long serving Secretary, while Linda will be carrying on after “more years than I can remember” as our Treasurer. In Merrill’s place I was voted in as the new President and Esther has become the new Secretary. We all owe Merrill and Janice a huge vote of thanks for their hard work and dedication. As Esther and I take over we realise just how much they have been doing for the group. I am also very pleased to say that Linda is a fount of all knowledge! To wind down after all this change, we were introduced to Tai Chi by our speaker Roger Agar-Hutton. Tai Chi is a form of exercise used nowadays to improve health, mobility and wellbeing. In ancient China it was such a successful form of martial art that it was taught to the Emperor’s personal bodyguards as a form of self-defence. It was later exported throughout the world including America and Great Britain. Some people believe it prevents the onset of osteoporosis. Each move has its own name such as “white crane spreads wings”. We then cleared our chairs back and had a go ourselves, enjoying the calm sweeping movements. As they say “the Yi leads the Chi”! 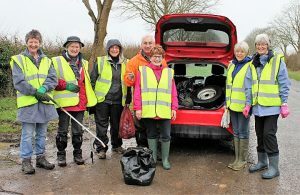 On Sunday 14thApril a hardy group of WI members helped clean up the village at the Litter Pick and on the 26thApril we enjoyed a delicious supper at The Red Lion pub. Our speaker on Tuesday 14th May will be Julia Miles. Her talk will be entitled “Ragbag and Cocktail: 28 years abroad as a diplomatic wife”. If you would like to join our sociable group please call me on 01869 222650 or email Sue57.WI@gmail.com. To celebrate St David’s day a group of us went to The Red Lion in Adderbury for a very tasty lunch. This concentrated our minds on our next pub outing which is now planned for the evening of Friday 26thApril at The Red Lion in Steeple Aston. 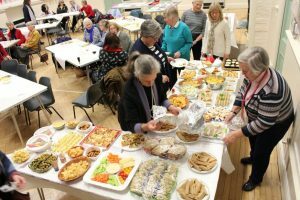 For our 101st Birthday Celebration Night we brought and shared a tempting and generous assortment of sandwiches, quiches, dips, nibbles and cakes all provided by our WI members and the committee. Merrill then lit the candles on a delicious lemon cake made by Linda which was shared amongst us. 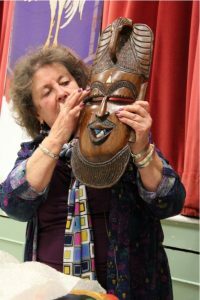 Our speaker for the night was Christine Farmer who spoke about her collection of masks. Her favourite was a Barong mask, used to protect important buildings such as temples. She told us of travelling puppeteers telling epic tales using perhaps 30 puppets and speaking 30 different voices. Ancient Greek theatre consisted of comedy and tragedy only. Handcarts were turned upside down to form the stage. In Venice there were mask vendors on the sides of the canals. The masks were often used for liaisons. Plain masks were made by Japanese travelling actors entertaining the Samurai classes in the purest form of theatre and in Peru masks were made from shells, feathers, twigs and bark or cork. Apparently in Latin America it was an honour to be sacrificed! Christine was a very knowledgeable and entertaining speaker and we learned so much on such a fascinating subject. Our next meeting on Tuesday 9th April will be our AGM when a new President will be voted in by our members. We will then be instructed on Tai-Chi by our speaker Robert Agar-Hutton. If you would like to join our friendly group please phone our President Merrill Bayley on 01869 347802. We enjoyed a busy meeting starting on a cheerful note by singing Happy Birthday to four of our members. One of our newest members was officially elected onto our committee, thus injecting new blood to keep us on our toes for the future. Pauline has arranged up pub lunch to celebrate St David’s day at The Red Lion in Adderbury. Linda and the committee officially handed over four winning tickets for the performance of ‘Calendar Girls’ in Oxford. The winning tickets were drawn last year – our centenary year. Several members had brought ‘flowers in bloom’ for our monthly competition and The President came a respectable second with an early camellia! First place went to Jill Vallis. Julie Smith told us about a recent course both she and Merrill attended at Denman College on Criminology. She thoroughly recommended Denman for it’s wide range of opportunities, as well as being so convenient for us located at Marcham. Our speaker for the evening, Bruce Duncan gave a most amazing and poignant talk. His book, The Loan Soldier, is about his and his family’s experiences in places where the UK is asked by various Governments to supply British military personnel for defence and training. From Oman, Aden, Jordan then Sudan and Nigeria and his favourite Brunei. Then he spoke of the horrors of being trapped in Kuwait when Saddam invaded, and the tragic death of his eldest son whilst trying to escape. We were enthralled and gripped by this incredible soldier’s experiences. Our meeting in March will be our 101th Birthday, on birthday night our members will be bringing along their own offering of ‘cuisine on plate’. Our guest speaker, Christine Farmer will, I am sure regale and enlighten us and hopefully with some specimens of her topic ‘Masquerade’ – the history of masks. Should you wish to know more about our WI and or want to join please don’t hesitate – contact me Merrill Bayley on 01869 347802. Our first meeting of the New Year was a social affair with members enjoying three different types of quiz with prizes. Most of them chocolate, I did hear groans of ‘no not more choccy’ and ‘I really can’t eat any more sweet stuff”. Janice brought in some small bags of her famous ‘pecans’ which always go down well. We had some positive feed back after the evening, and we may be able to include another social evening into a future programme by request. Our next meeting is on Tuesday, 12th February. Our speaker is Bruce Duncan, and his presentation is called The Loan Soldier – a snapshot of a military family living in challenging locations.If you feel that you would like to join us, please contact our President, Merrill Bayley on 01869 347802. On the 11th December 33 members had a lovely evening with a delicious meal provided by S & J Catering. The hall was decked with festive bunting, a Christmas tree and floral displays made by Isabella. 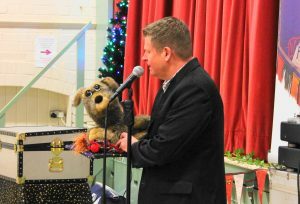 Our entertainer was Paul Dumas, a talented singer and ventriloquist who kept us laughing with his puppets Charlie Monkey, Scotty Dog, Northern Elvis, Billy the Baby, Louis Armstrong and Nelly the Old Lady from Banbury. We all sang along with his renditions of oldies but goodies such as Tulips from Amsterdam, Ken Dodd’s Happiness, Singing the Blues and Winter Wonderland. The raffle prizes included a ticket to see Calendar Girls and some beautiful Cyclamen plants. A thoroughly enjoyable time was had by all. On the 13th December we congregated in St Peter & St Paul Church for a Carol Service attended by all the local WI Groups. Refreshments were provided including mince pies and coffee. We also had a table at the Wassail in the Village Hall on the 16th December. A very festive evening for all the family. Looking forward to 2019 we have plans for a social evening in January, a fascinating talk in February from Bruce Duncan about military families living in challenging locations and in March Christine Farmer will be talking about the history of masks on our Birthday Celebration Night. To join our enthusiastic and friendly group please contact Merrill Bayley, President on 01869 347802 or mjb16@talktalk.net. We would love to hear from you. This month we had a good turn out with two new members who joined up and one visitor. 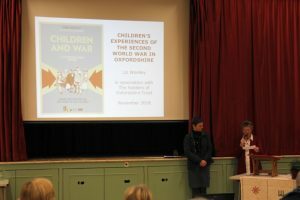 We had an excellent and enlightening talk from Liz Woolley who spoke to us about Childrens’ experiences during WWII in Oxfordshire. She spoke about evacuees coming in and out of the county; some of their experiences were good with children keeping in touch with their billeting families to this day. Others had experiences that were pitifully sad and regrettable. Liz is affiliated with the two regiments, the Oxford Yeomanry and the Ox & Bucks who have created a new exhibition annexed to the Museum in Woodstock. 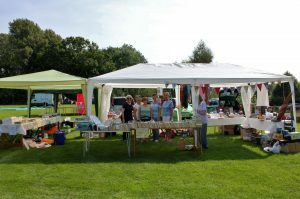 Our attendance at the Church Fete back in June was a great success, so much so that we submitted a photograph of our stand and an accompanying article that was then published in the Oxfordshire WI Magazine ‘News & Views’. November was an action packed month. On the 14tha group of us attended the pantomime Aladdin in Chipping Norton it was great fun! We had an early supper at Whistlers (they had opened especially for us). On the 29thmany of us met up for a Supper Night supporting our local pub, The Red Lion. We will also attend the Wassail night with a WI table of family and friends. The members’ Christmas Dinner will be on 11thDecember with local caterers S&J supplying the fare, and we will be entertained by Paul Dumas. Our new programme will commence in January, promising to cover a wide variety of subjects with something to interest one and all! Please contact Merrill Bayley on 01869 347802 to find out more if you would like to join our busy WI! Our members were joined by one visitor for the October meeting. We opened with a variety of announcements of forthcoming events and current topics of interest. Among the topics of interest we heard that: Steeple Aston WI is to be represented in the Oxfordshire Federation WI Annual Quiz later this month (October); we are to host the half-yearly meeting of our six local WIs (known as the North Ploughey Group) on the 23rd October; and, we are also to host the annual carol service for the North Ploughey Group in Steeple Aston church on the 13th December. We welcomed our guest speaker Stewart Linford who entertained us with ‘The remarkable story of our national chair: The Windsor’. We learnt that the Windsor chair is the term for a method of construction rather than a particular manufacturer. 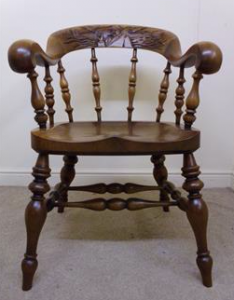 Recent Windsor chairs have been made by companies such as Ercol, but their manufacture goes back centuries and is characterised by having a seat made and carved from a single piece of wood into which the legs and back are round-tenoned into drilled holes. This differs from standard chairs where the legs continue up into the back. 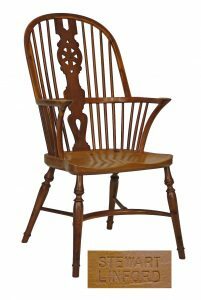 It was interesting to learn that the various components of the Windsor chair are made from different types of wood, each one selected for its particular properties. So the seat is typically made of elm for its hardness and ability to be drilled close to the edge without splitting, whereas the curved backs would be made from a more readily bendable wood such as ash. Stewart’s talk came to life by virtue of the examples of Windsor chairs which he brought with him; we were particularly taken with the ‘Winston Churchill Chair’ which was larger than life and had a cigar drawer underneath its seat. At our next meeting on the 13th November our guest speaker will be Liz Woolley telling us about ‘Children’s Experiences of the Second World War in Oxfordshire’. If you fancy coming along visitors are most welcome to attend a meeting. Please contact Merrill Bayley, President, on 01869 347802 for information. Our September speaker was different to the one in the programme. We were very pleased to have with us Alastair Lack, with his talk ‘Travels with Auntie’ My Life With The BBC World Service. His first sentence started with “most people have a favourite Auntie to be loved and respected”, and this is how he felt about working for the BBC. Alistair worked for the BBC for about 30 years at Bush House, most of the time with the World Service, at a time when Bush House was all pillars and glass. They provided a 24 hour every day, 365 days per year English Language Service. He has interviewed many statesmen and politicians Kofi Annan, Ronald Reagan, Margaret Thatcher. One time when Gorbachev was under house arrest, someone asked why he was so relaxed about it he said he was listening to the World Service! He has reported from war torn countries, the Middle East, South Africa, Falkland Islands and Berlin after the wall came down. The BBC really came into its own during the Second World War keeping the people all over the world in touch with each other. 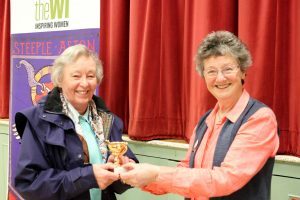 At the Horticultural Show in August we were pleased to present the WI Coronation Cup to Vicky Clifton. We have several walks planned for September and October. A pub lunch has been arranged for early October, and we have a team in the OFWI Quiz Night in Kidlington. At our meeting we were pleased to have one new member and three guests. 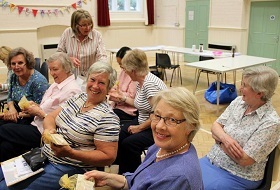 If you would like to come and give the WI a try, please ring Merrill Bayley on 01869 347802 or just turn up! With no WI meeting in August, a brief re-cap of our special events and activities during the recess will be my contribution this time. 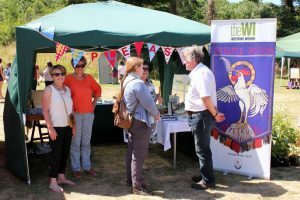 We had a gazebo presence at the Church Fete back in June with lots of leaflets about our WI, the wider group, the WI College Denman, and a table full of examples of the various handiwork and crafts made by some of our members, from silver work to embroidered cushions etc. 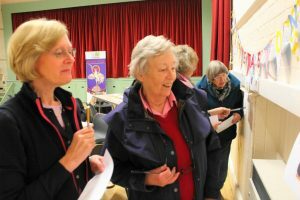 We had some very good interest from passing ladies who were surprised by the choices and range of activities on offer from the WI. We were able to quash some preconceived ideas they had about the WI too! We are an all-encompassing group with the ethos of “if it’s not fun to do let’s not do it!” So we welcome all women over the age of 18 from working mums and especially the newly retired. We have a varied selection of speakers some are bound to be of special interest to You! We usually have a bric-a-brac stall at the August Show to bring in funds, but this year we decided we needed a rest after the hard graft last year of raising funds for our centenary, so we went as visitors instead! A bunch of members lunched at the White Horse in Kings Sutton on 20thJuly a thoroughly convivial time was had there. The meal and venue rated as a spot for a return visit. Each WI in Oxfordshire has been tasked with embroidering a leaf motif, on a green panel, with the name and date of inception of every WI. Our contribution was kindly designed and executed by Angie. We shall see how OFWI, celebrating their centenary next year will utilise these green leaf panels! Our next meeting is on Tuesday 11thSeptember at 7.30pm at the Village Hall. 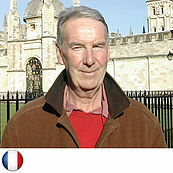 The speaker will be Stewart Linford, his subject our National Chair; The Windsor. If you would like to come and join the WI and want a ‘taster’ first, please roll up at the Village Hall or contact me Merrill Bayley on 01869 347802. Our members were joined by two visitors for the July meeting which opened with a variety of announcements of forthcoming events and current topics of interest. Among the topics of interest we heard that our local MP Victoria Prentis had responded positively to an invitation to attend a WI-organised parliamentary event campaigning for action to reduce the impact of microplastic fibres on the marine environment. 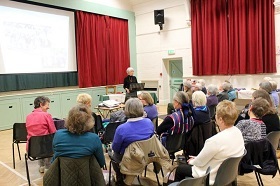 We welcomed our guest speaker Muriel Pilkington who gave us a well informed talk entitled ‘Votes for Women’, a very topical subject as Steeple Aston WI celebrates its centenary in the same year that women’s suffrage records its 100 year milestone. We were reminded that 1918 was just the start of the process as the vote was only granted to certain women over the age of 30. Equality with men was not achieved until 10 years later. We have a break from meetings in August and resume on the 11th September when our guest speaker Stewart Linford will recount ‘The remarkable story of our national chair: The Windsor’. We trust that we will be sitting comfortably for him to begin. 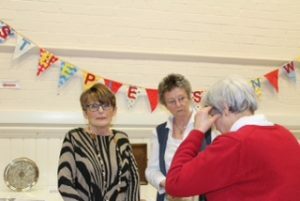 There is always the opportunity for cake and a cuppa, as well as meeting friends present and future – if you fancy coming along visitors are most welcome to attend a meeting. Please contact Merrill Bayley, President, on 01869 347802 for information. June was a busy month, on the 9th Steeple Aston WI were invited to join Shelswell WI for a walk and ploughman’s lunch. This was the North Ploughly group walk and we all met up at Stratton Audley Church. On offer was a short walk around the village, or a longer one across open fields and copses with plenty of stiles to test our agility. We were led off at a ‘brisk’ pace up to ‘SAWG’ speed so covered the 4 miles or so pretty quickly, despite stopping to look at the glorious views as we waited for stragglers! Lunch was enjoyed in the strange surroundings of a Church with the pews missing in the middle, replaced by big round tables! This church was simply used as a village hall, though apparently chairs could be moved to the middle for services. A Denman course on Criminology lured Julie Smith and myself to complete the 12 all lady jury members trying historical murder trials, one a hanging (would have been all men back in 1924). Interestingly we came to the same verdicts. Tuesday 12thJune was billed as our Summer Outing. This event was a coach trip to Windsor, a glide up the Thames, with alternative WI ‘skipper Penny’ taking us into the lock even! We enjoyed a ploughman’s lunch. Merrill took the helm whilst turning the sharpest bend on that particular reach, humorous remarks abounded about how many swans were ‘nudged’ on this leg of the trip! We were given a spirited and informative commentary by the ‘real’ Captain and we all returned safely to our moorings leaving members the option of legging it up to the Castle for a brief glimpse of The St Georges Chapel where The Wedding took place, with oooos and ahhhs about who was sitting where in the nave! Some took an open top bus to Eton and surrounds, apparently followed by a cream tea! Others window-shopped and some actually shopped, others had a stroll around this very historic town. Weather wise it was a pretty cloudy dull day, but luckily it did not rain. Our luck held for our journey back, we witnessed a collision, between a white van and a blue BMW with no apparent serious injuries. Luckily our driver was able to slow down in time. A few moments later and the story would have been very different. Our WI’s lucky day! 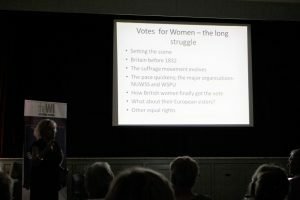 Our next meeting is on 10thJuly – appropriately all about Votes for Women by Muriel Pilkington. 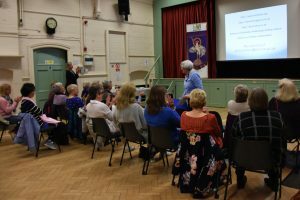 This month Mary stepped in for Merrill and gave us updates on forthcoming events, including the day out in June, and a group walk in Stratton Audley. Linda then went on to inform us about some current resolutions which we discussed and voted on. Our guest for the evening was Malcolm Hill, a wood turner from Northamptonshire. He brought along his equipment and gave us a demonstration on his lathe, using a hand tool to carve into the wood. He introduced us to different woods and also explained how he managed to source them. Some are donated, such as Yew, which is often found in churchyards, while others, especially those from abroad, can be very expensive. However, there were many different varieties of weight, grain and colour to be seen and handled. 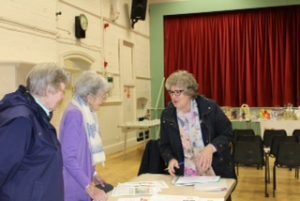 During the course of the evening Malcolm’s wife Val supported his demonstration by talking individually to members about the various artefacts for sale on the table, which included clocks, fruit, bowls and many more. The first object to be demonstrated by Malcolm was a rather elegant bud vase made of yew. He followed this by carving a shiny apple from cherry-wood (with a clove for the stork), and finally a little spinning top. All sanded down and finished off with a sealer to bring out the rich colour and grain, and polish made from carnauba and beeswax. These were all donated to the raffle alongside the other prizes so it was an extra bonus for a few lucky winners. Members were then able to catch up over refreshments and the evening drew to a close with the flower prize. 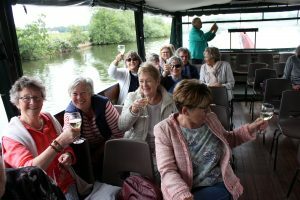 There is no meeting in June as it will be the members’ day out on the river in Windsor, so we are hoping for a lovely sunny day! If you would like any information please contact Merrill Bayley, President, on 01869 347802. Written this month by Angie Allen. April is the month we hold our AGM. All the usual business was conducted with great efficiency – committee members announced, president voted for and reports given. Merrill was happy to stay on as president once more in order to see out the programme of events we have planned for the rest of our centenary year. Every month we ask our members to bring a single flower from their garden to be judged by the speaker for that meeting. We keep a tally and this year Margaret Mead won the Cup – a few giggles were heard (even from Margaret) as it is she who keeps the record book!! Once the official business was done we invited Patrick Fitz-Gibbon on to the floor. 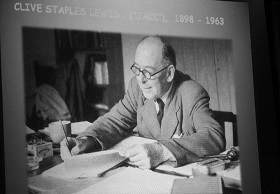 His talk initially centred on his father’s disappearance after WWII. With much obfuscation from government departments and little or no communication from his father, Patrick, having put the few jig-saw pieces together, surmises that his father led some sort of ‘Pimpernel’ existence! He then regaled us with amusing tales of bizarre events during his trips to Russia. Not wanting to steal his thunder I will say no more – Patrick has written a book. Please contact him should you wish to avail yourself of a copy. Our next meeting is on Tuesday 8thMay at 7.30 in the Village Hall. 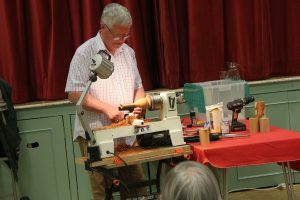 The speaker will be Malcolm Hill – Woodturning: A talk and demonstration on how to turn a piece of wood into a work of art. We always follow the speaker with a cake, cuppa and chance to catch up with old friends and make new ones….. so please contact us should you wish to come along – you are most welcome. Tuesday March 13th 2018 was the night that Steeple Aston WI celebrated our 100th Birthday with a gigantic celebratory night of fine dining and entertainment! It was a red carpet event, with ornamental trees bedecked with Suffragette purple bows setting the welcoming scene. The stars of the evening; the birthday cake made by Linda Needle, settled proudly on a table draped with our WI embroidered tablecloth, with of course a gorgeous little flower arrangement to show it off and alongside that, our magnificent trusty old Banner. The fireplace, top table and circular tables all had resplendent floral arrangements befitting their respective positions. All these flowers arrangements were designed and created by Isabella Cleaver and Jill Vallis and they truly transformed the hall, a magnificent display! Cometh the hour, cometh the guests, six o’clock, and members and guests were announced by our Toastmaster wearing his full regalia (hunting pink?) then down the line of WI Committee office holders! Early birds receiving a cheer! Hands all duly shaken, warm welcomes extended, coats taken, all were invited forwards towards the stage where welcoming glasses of sherry and canapés were served by the helpful waiters! The said waiters turned out to be Singing Waiters from Opera Anywhere, to the delight and complete surprise of guests and members alike! The seating plan; a chronological list of all the Presidents since 1918, and a list of companies and individuals who have supported us in the last past, were displayed on the easel. Each place setting had the member’s name on a special card, menu choices listed, and the place mats were laminated copies of the minutes of the first WI meeting, all these for members as a keepsake. The toastmaster called us to our tables, I welcomed our special guests, Sir Hugo & Lady Brunner, he a former High Sheriff of Oxfordshire and former Lord Lieutenant of Oxfordshire. Our other guests, Pauline Goddard, Chair of Oxfordshire Federation of WI’s, Beryl Mann WI advisor and a past president from 1979 Dorothy Roberts. Jerusalem was sung with considerable verve, volume and aplomb led by Opera Anywhere! The first toast, was to our guests, the second to all 9 past presidents, each rose as their names were called, and each had been given small bejewelled ribbons of purple and green, a symbol of the suffragettes. The whole ‘dining experience’ was provided by Croxfords who’s attention to detail was faultless as was the quality and quantity of their cuisine. The whole hall was lit with ‘mood lighting’ themed with the purple and greens so very effective! On the stage the entertainment, especially tailored for us, Opera Anywhere, commenced a repertoire of songs from each decade since 1918. Three sopranos and a most accomplished pianist sang their hearts out for us to a standing ovation finale. After I had thanked one and all, Julie Smith on behalf of the members kindly stood and thanked our 100 Committee, what a lovely touch! Posies of flowers were then presented to each of our guests and the toastmaster bid our members and guests farewell following the Nation Anthem. Next morning most of us managed an 8.00 am start for the clear up! We have been overwhelmed by messages of thanks from members and guests alike a mark of a truly memorable evening. If you would like to join us at our April 10th meeting please give me, Merrill Bayley, a ring on 01869 347802 or email mjb16@talktalk.net and I’ll arrange for someone to meet you, or collect you on the way! 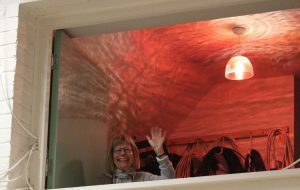 The speaker booked for our February meeting had to cancel, so we were pleased that Sue Drage was able to step in and give us a talk and show on ‘Recycling with a Difference ‘. 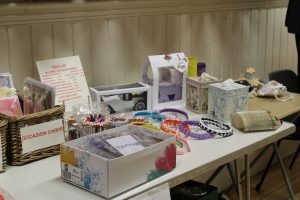 Sue had on show an array of items, skillfully crafted from all kinds of rubbish, including plastic bags, old tee shirts, ring pulls, crisp and cereal packets. These were made into items which included dog leads, bags, also jewellery and other decorative objects. 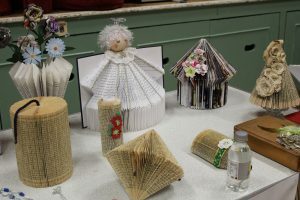 Book Art, using origami techniques, is another of her interests. These were all very different and made an inspiring and colourful display. Probably one of her more unusual projects to have taken on, was to knit a suit for Camilla the Chicken. As a result of a knitathon, in 2012 Sue was asked to knit a protective suit for the mascot of NASA’s Solar Dynamics Observatory, which is used to educate young people about the space programme. After a few attempts she managed to knit a suit from plastic bags, which was used for the project. Camilla has had a number of suits made in America but this meant Britain could have a part in this as well. If you were tuned into the Lilley Mitchell show on BBC Radio Oxford last Thursday afternoon you may have heard Merrill and Linda giving an eloquent interview about the WI and the run up to the centenary. 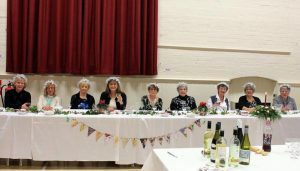 They spoke enthusiastically about their own experiences and also some of the background history, and did a splendid job of representing the village WI. Now the final touches for the March celebration are under way. See our latest photographs by Angie Allen. A night of “. . . chaotic fun carried out in an orderly fashion” this was my reflection after our annual Social Evening! 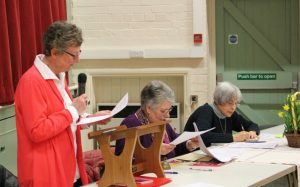 Once the business of renewing memberships and accepting hand delivered responses for our Birthday dinner in March from our members, Julie Hillier outlined the WI resolutions for consideration and the ballot papers were collected. There was an additional resolution put forward by our Oxfordshire Federation and this was introduced by Veronica Wilson the topic being to increase the size of ‘new build’ disabled toilets to be more suitable for ‘assisted’ adults and this resolution was passed on a show of hands. A member of our Committee has since been asked to speak in support of this at the OFWI Annual Meeting in Oxford in March. We then settled in for a fun social evening, a glass of wine and soft drinks first, then the icebreaker quiz compiled by Janice Kinory mainly for the benefit of our new members – the content of the questions were designed to ensure the new members had opportunities to ask fellow members to confirm or otherwise, if they were in fact the member who was, for instance an author, was Welsh, or had been to University, lived abroad and so on. Lots of guessing and false dawns on this one but generally the ‘old hands’ got it right. We then had the fun of identifying members from their ‘baby’ photos – very low correct results on this one! 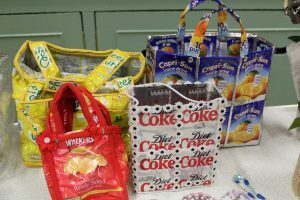 Finally a humdinger of a quiz run by Mary Rushworth had the grey cells buzzing – winning teams all received prizes of lots of sweets! There were of course the usual prizes; the he monthly ‘best flower bloom’ won this time (worth mentioning) by me! Our next meeting in this our glorious 100th year, will be on 13th February, all about Alastair Lack’s time with the BBC World Service. Should you wish to come along and join the WI and want a ‘taster’? Please contact me Merrill Bayley on 01869 347802. See the latest photos on Smilebox here. The weather; there was snow then the freeze – will we be able to carry on with our Xmas supper on ‘Icy Tuesday’ 14th? But the show must go on we are the WI! What, cancel our unbroken record – no way! The entertainment confirmed and Sally of S&J confirmed. Yes the morning was bright and sunny and ever so cold, but the Village Hall pathways were in need of some clearing and gritting – El President to the rescue paths duly gritted! The Village Hall committee had already decked the hall with plenty of Xmas lights and our dedicated committee members naturally added sprinklings of holly and ivy on the snow-white tablecloths, Xmas baubles tea-lights, festive napkins and cyclamen. The plants were later presented as raffle prizes for the lucky winners. On arrival members exchanged Xmas cards and much chatter about planned activities over the festive period and the forthcoming 2018 Centenary year celebrations. 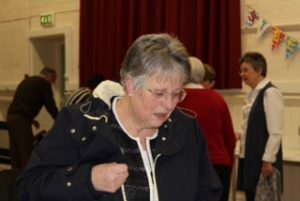 Catherine had designed and hand made the Xmas cards for all the WI members, what a feat! She also made the Xmas halos for each of us gold, silver and reds and greens. S&J Cuisine provided us with the full dining experience – yes waitress serving at table we know how to look after our members! Whilst enjoying coffee and after eight mints, members of the committee handed out our special Centenary Programme for 2018. Then the entertainment, the group called Pandemonium did us proud with plenty of hilarity with Wassail singing and more! 2018 is our magical year, special events are planned and recognition of what our WI has achieved in our first 100 years and of course our continuing plans for the exciting future of Steeple Aston WI. At the November meeting members gathered to hear the the latest updates, with some items of interest for members to peruse. There were several birthdays to celebrate this month, and three new members were given a warm welcome to the group. This month the Oxfordshire Federation has been collecting and decorating shoeboxes filled with toiletries for the Oxford Women’s Refuge , so members brought along a variety of items to fill a couple of these boxes. Our speaker for the evening was Graham Horn, with a talk entitled ‘Tales of a Blue Badge Tourist Guide’. Graham entertained us with some interesting and humorous tales of tours, and gave us an idea of the extensive and varied background knowledge and training necessary to qualify for this. He leads tours covering a wide range, and having an accredited badge for Windsor Castle is his most highly prized achievement. He tested members’ knowledge with a lighthearted quiz taken from some old exam papers, and was happy to answer a variety of questions at the end . After the talk friends had a catch up over refreshments, and the evening was brought to a close with the flower and raffle prizes being drawn. On the Wednesday evening several of the members were entertained by an excellent production of ‘Sleeping Beauty’ at Chipping Norton Theatre, which they enjoyed after a pre-panto meal at Whistlers. The next meeting on 12th December will be our Christmas meal which members can enjoy alongside some lively entertainment, so this is something to look forward to. On 14th December there will be a carol service hosted by the North Ploughley group, at Stoke Lyne Church, and members are welcome to attend. Please contact our president, Merrill, on 347 802 if you have any queries about Steeple Aston WI. October at the Steeple Aston WI is when we start thinking about the coming of winter, and yes, Christmas! We ran a Christmas card competition to enter the four best handmade Christmas cards into the North Ploughly Group meeting which will be held at Duns Tew. All cards will be sold in aid of the Association of Country Women of the World (ACWW). We also had a sale of books and magazines donated by our members after a clear out of their houses after the end of summer. Also present for sale at this meeting were preserves made by our members, including courgette piccalilli and gooseberry jam. Every bit of money which we raise will go to our WI centenary celebrations which will take place on Tuesday 13th March 2018. We were very happy to welcome two new members who joined us at the October meeting in which red and white wine greeted new and old members upon arrival. A few days after our Tuesday meeting, some of our members were also able to partake of a wonderful lunch at the Pickled Ploughman in Adderbury on Friday the 13th. No spooky or unlucky going-ons were reported! Our next meeting is at the Village Hall on November 14th at 7.30 pm, when we will be welcoming Graham Horn who will talk on “Tales of a Blue Badge Tourist Guide”. New members are always welcome to join us, enjoy our excellent speakers and our wonderful array of tea, coffee, cakes and biscuits served at the end of each meeting. 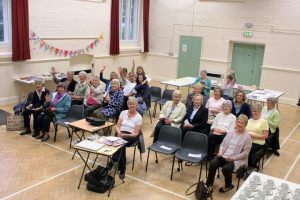 The committee and members of the WI pulled out all the stops throughout August in a major endeavour to raise funds towards our centenary yearlong celebrations, starting in March next year. Julie Hillier kindly opened her garden as the venue for these events. The Coffee Morning and Garden BBQ brought out WI members in force as well as our many friends. Auction lots were generously provided both by personal contributors as well some of our local companies: Nicholson’s Nurseries, The Red Lion, The Holt Hotel, Hopcroft Holt Service Station and from Banbury, Hair Concepts. We thank them all for their very generous support. With these two events alone we are now well on the way to achieving a wonderful program next year. Many of you will have seen our marquee at the August Show. This year we had so many contributions from our members that we had to extend the tent! The beautiful sunny day was a joy and the canopy served to keep the sun off rather than the rain! A big thank you goes to all those who bought goods from our stall. Unsold items are donated to Katharine House Charity and books are passed on to Christopher Compston for his charity. The funds we raise help with our yearly running costs. Our next meeting is on Tuesday 10th October, in the Village Hall at 7.30pm. The speaker is Rob Pritchard who will enlighten us on What Smart Meters Can do for You. Should you wish to come along you are most welcome. Please contact Merrill Bayley on 01869 347802. To see more pictures of the Summer Show, please click here. 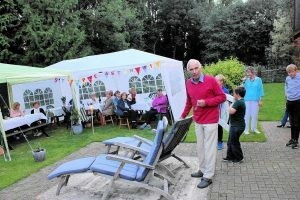 The BBQ fund-raiser was at Julie’s garden, and we had extra marquees for our guests’ comfort, as this was an evening event. On offer for the guests were lashings of Pimm’s to quench their thirsts, and a splendid array of burgers, bangers & chicken drumsticks and lots of side dishes all provided by our Committee, which included our traditional Eton-mess amongst the ‘pud’ selection. Our auctioneer was Vaughan Billings whose humorous style elicited the necessary result out of our assembled throng – plenty of bids for the various lots on offer! We had a wonderful range of donated raffle prizes and goods for auction. There was Aunt Sally and Boule for entertainment but our guests seemed to prefer to sit and enjoy the Pimm’s and the magnificent grub! A very hearty thanks to all our members and all the friends who joined us for our fund-raising events, and judging by the responses – everyone thoroughly enjoyed themselves! All contributions have been gratefully received and placed in our special centenary fund for our 2018 celebratory year. Our special 100th anniversary fund-raising Coffee Morning on Saturday July 22nd was our very lucky day! The terrific Friday afternoon winds did not blow our gazebos away, only loosened all the guy ropes and the overnight rain did not wash them away, but only created ponds on the tops of the gazebos! Saturday morning dawned bright and breezy, ideal drying weather – the forecast threatened rain at noon. We had our window 10.30 am to noon – would it hold? Balloons – WI green, and the purple of the Suffragettes bedecked the gateway to Westfield Farm Mews – so that guests from far and wide knew where the WI Coffee Morning was being held. 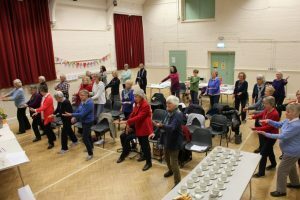 The expected throngs arrived and bought raffle tickets by the score, devoured the homemade WI cakes and the welcoming cups of tea and coffee. Ted Atkins very kindly agreed to be our auctioneer and duly enticed and cajoled the eager and reticent alike to call out their bids, for the wonderful lots on offer. We had 4 lots of resplendent plants kindly donated by Nicholson’s, a delightful artists original painting, a Golf Day; dinner at the Red Lion and a retro radio! All sold off amidst great hilarity and enthusiasm. Just as the last lot went under the hammer the rain made a gentle entrance and the punters left with due decorum. Thank you to the guests and WI members who came in their throngs and those who were not able to attend sent donations and or bought raffle tickets in the true WI spirit of fund raising. Yes of course we will have more fund raising events – our next will be a BBQ and invitations are already going out!! July has been a fairly busy month so far. Plans are continuing for the big birthday event next March so there is still much organisation to be done and decisions to be made. At the July meeting Merrill talked about additional fundraising plans for this event, and we had a show of some very favourable auction prizes which are going to be available for members and their guests to win at our coffee morning later in the month. Our speaker for the evening was Nick Brazil, who delivered an interesting presentation entitled ‘Bizarre Victorian Inventions ‘, many of which were indeed bizarre, but often very inventive. There were some fascinating ideas represented in the drawings projected. Nick explained the idea and the purpose behind each as they were shown, although many spoke for themselves. However, several of these ideas proved unsuccessful at the time and had to be scrapped, either because they did not work, such as the voice operated sewing machine , or were too dangerous, as was the Lewis Harper monocycle. Some of the most interesting of these early inventions Nick showed us were the various ships that were constructed during the 19th century, designed with safety and comfort in mind, but not always proving to be worthy of their claim. Bateman’s Jam Jar lifeboat and Henry Bessemer’s anti seasick ship, which twice demolished the pier at Calais , were two of these that were scrapped. After Nick Brazil’s talk we had a look at the photographic reproduction of the Steeple Aston WI banner, which will be shown in the centenary year. This has been organised by Merrill, and shows up the colours and detail in the embroidery beautifully, so was much appreciated by members. Tea and cakes were served and a prize given for the chosen winner from four lovely summer blooms. We do not have a meeting in August so are having a barbecue to raise funds, which will be something to look forward to.We hope you are able to come along to browse the WI stall at the Annual Flower Show.Please contact Merrill on 01869 347802 if you would like any information. Each June, our regular Village Hall meeting is replaced by something with summer in mind. This year the weather did not disappoint. Julie Hillier (as in past years) kindly opened her garden for our annual summer meeting. We erected an array of pagodas and a marquee, lit the barbeque, made Pimms and feasted on strawberries, raspberries and cream for dessert. Those who live close by would have heard whoops, cheers and much laughter as we competed in a game of Aunty Sally. Hotly contested to the end with some interesting throwing techniques on display such as an American softball swing! The favoured throw was a swing down between the legs and up into the air! Familiarity with the lie-of-the-land may well have favoured the winner, Julie Hillier. Earlier in the month we lunched at the Pickled Ploughman in Adderbury on one of our regular excursions. The service was exceptional and the food was delicious. Well worth a return visit. Fund-raising is high on our agenda as we count down to March 2018 when we celebrate (in style) our 100th anniversary. 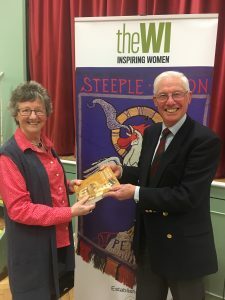 The women of Steeple Aston WI have met every month since 1918 – what an achievement! We are, therefore, hard at work planning as well as conducting our regular meetings, outings and events. Our next big event will be at the August Flower Show where, as usual, we will be selling all things WI – cakes, jams, craft – as well as the ever-popular bric-a-brac selection. So do remember to come along. It is also a great opportunity to pick up information about the WI. Our next meeting is on Tuesday 11th July in the Village Hall at 7.30pm. The speaker is Nick Brazil who will enlighten us on The Bizarre World of Victorian Inventions. Should you wish to come along you are most welcome. Please contact Merrill Bayley on 01869 347802. For photos of the Summer party, please click here. May was Resolution night; there were two resolutions to deal with, one was Plastic Soup: keep micro-plastic fibres out of our oceans, which was presented by Merrill and the other was Combatting Loneliness raising awareness of the causes and impact of loneliness to ensure better identification and thence the ability to offer appropriate support; Janice put forward this resolution. Our members were invited to discuss the subjects and a vote was taken, both motions were carried, our results will be passed on to our group Delegate who will vote on our behalf at Annual Meeting at the Echo Arena, Liverpool on 7th June. We were delighted to greet a new member to our WI and she was welcomed in with plenty of enthusiasm. In fact she immediately joined in the spirit of the WI and volunteered to bake a cake for us! We have a most worthy new member here; she will I am sure participate fully in all our outings and activities and will have the opportunity to go to Denman College where there are opportunities to embark on new hobbies, interest groups or craft, and can be truly inspired by what is on offer for all members. Our talk was about WI’s very own Denman College in Marcham, Virginia Lawrence gave us a very enlightening and interesting explanation about the founding of the College and it’s wonderful legacy to inspire and educate WI members. There are so many different courses on offer within the groups of craft, history, music and the all-encompassing ‘lifestyle’! 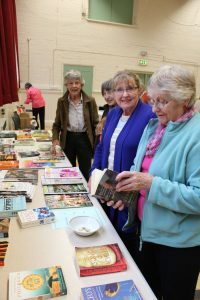 Traditionally May is the evening when members bring books and magazines to sell, spilling onto two tables, the left overs will be passed on to our WI stall at the Summer Flower Show. Our members will now be looking forward to fine weather for our Summer Outing – a garden BBQ on 13th June. If you would like to join our WI and would like to try us out first, we will be delighted to welcome you at one of our meetings. Please give me, Merrill Bayley a ring on 01869 347802 or email mjb16@talktalk.net and I will fix it! Friday night was WI Pub Supper night, an evening event to ensure our working members are not left out, we tend to have more pub lunches, but we aim to cater for all our members over the course of the year! Oh dash it all, but of course one does not have to be employed to join in an evening pub supper! 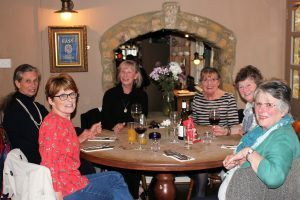 We were 6 members sitting at a nice round table, the location; The Unicorn in Deddington, now under new management so of course we had to try it out, supper all neatly pre-ordered so all we had to do was source the wine for our table. Some of us had starters followed by fish and chips, and jolly good they were too, having decided not to have sweets; it transpired that most of us changed our minds and duly indulged it was that sort of evening! As the photograph clearly shows we had a brilliant time, we laughed and joked throughout, and I for one can’t remember having such an extraordinarily good set of very hearty laughs throughout an entire evening. Some of this was courtesy of Julie S., who regaled us with an interpretation of a presentation style of a speaker she had recently heard. We were in stiches throughout; well each of us did add our own anecdotes of humorous occasions we had witnessed to add to the hilarity of course! Our designated driver was Catherine Crook, who managed to squeeze Julie, Linda, Mary and I into her car and the return journey was just as much fun, sorry Liz drove herself home in the opposite direction and missed out on a bit more hilarity. We can’t guarantee total and permanent hilarity at all our pub venues, but we can say that they will all be fun and friendly and enjoyable. If it’s not fun to do let’s not do it! That’s my motto!! Our April meeting is the AGM for the Steeple Aston WI when the President and Committee are elected. Proceedings started at 7.00 pm when we had reports from the President, Treasurer and Secretary. First was Merrill Bayley, our President, summarising our previous year’s outings and achievements as a group. She also asked us to save the date on 13th March 2018 for our Centenary Birthday night which promises to be a celebration to remember. Our treasurer, Linda Needle, gave us a report on our finances which are healthy at present and in line with our plans for this year’s celebrations. Our secretary, Janice Kinory, made a few remarks of thanks as she had already circulated her report. We then voted for President. While the votes were being counted, and in a last minute change to the programme, the speaker Catherine Jones entertained us with her talk entitled “From Guns and Roses to Hearts and Flowers”. She had plenty of magnificent stories of being a captain in the Army and then a wife, mother and writer. Her stories of chance and perseverance in the publishing world were an inspiration to anyone who is interested in writing for a living. Catherine had to find the time to achieve this whilst raising three children and moving all over the world with her husband, Ian Jones, an expert on bomb disposal (and our original speaker for the night but who was unable to attend). A member and former chairman of the Romantic Novelists Association, she also writes under the pseudonyms of Annie Jones, Kate Lace and Fiona Field. If you see her books, please pick one up as you will not be disappointed. Her main themes are love and war but also rowing and being a wife in the army. After Catherine’s talk, and with the votes counted, our President and the committee were re-elected for another year. Our next meeting is at the Village Hall on May 9th at 7.30 pm, when we will be welcoming Virginia Lawrence who will talk on The History of Denman. New members are always welcome to join us, enjoy our excellent speakers and our wonderful array of tea, coffee, cakes and biscuits served at the end of each meeting. Spring has sprung and our members have had a busy month taking part in a variety of activities and celebrations, not least our 99th Birthday Night. Needless to say we are already well underway planning a very special 100th celebration for next year. This year we sang our hearts out under the guidance of “Gareth Malone styled” choir leader, Jenny Matthews. Once again, as you can see, WI members helped clean up Sixty Foot on the Village Litter Pick. This year our ‘treasures’ included a plastic jerry can, a nearly new tyre and even a gentleman’s watch! Rich pickings indeed! Next month, on April 11th we host Ian Jones MBE who will deliver the intriguingly entitled talk, 40 Years in Bomb Disposal and still 10 Fingers. April is also our Annual General Meeting so we start at the earlier time of 7.00pm. Our meetings are held on the second Tuesday of each month in the Village Hall, usually at 7.30pm. Do come along – we love to welcome guests and potential members. We are happy to tell you more about the WI in Steeple Aston. Contact our President, Merrill Bayley on 01869 347802. The February meeting was a social gathering which gave members the opportunity to catch up after the New Year. 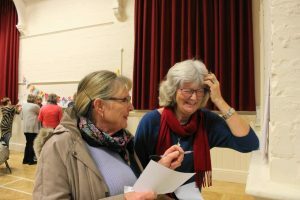 This began with a few announcements, which included plans for our 99th birthday night, some of the latest events coming up at Denman, and news on fundraising activities. A recent plea from the Chipping Norton Theatre, which relies mainly on local support, had a generous response from our members who enjoy the panto every year. The meeting was lively, with a Valentine themed quiz, which was a tie between teams; so everyone was a winner! Luckily there were enough choc bars to go round. A very amusing and a little bit crazy, ‘raffle with a difference’ followed on, encouraging much mischief- making amongst members, with some ingenious prizes. Entertainment was provided by our very own singing quartet with their rendition of ‘My Favourite Things’; although on a rather less romantic note than the original, with a rousing chorus from all members. As for future events, there are plans in hand for the centenary birthday celebration in 2018. Events coming up soon include participation in the village clean-up on the 12th March , and what looks to be an interesting day at the Tate Britain in early April, for the new David Hockney exhibition. The next meeting will be the 99 year birthday celebration on the 14th March, with supper and cake , so this should give members a welcoming start to Spring. Members only in March however, should you wish to know more about joining us please don’t hesitate to contact our President Merrill Bayley on 01869 347802 or email mjb16@talktalk.net. Our speaker Peter Hague talked us through the life and times of The Dashwoods at West Wycombe Park with great panache and enthusiasm. 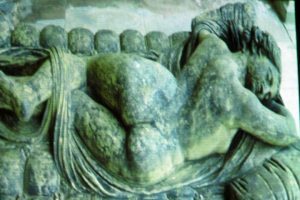 He gave us the full story about The Hell Fire Club which had been instigated by Dashwoods, and told us about the strange statue, pictured here, which needs to be viewed from both sides! There was a plethora of new sign up sheets enticing us to various events including trips to Longleat and Alexandra Palace and of course plenty of choice for the crafters, from a cake decorating workshop to needle felting. February is our Social evening and we will be having the ubiquitous quiz with probably a Valentine theme in view of it falling on the 14th February – that covers the brain challenge. For entertainment there will also be a ‘turn’ by members of the now seasoned cast of ‘The 4 Performers’, we will even fit in the little known ‘Irish Bingo’ to confuse, beguile and totally befuddle our fellow members! 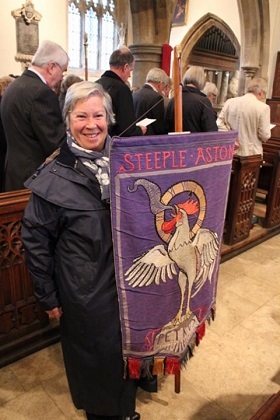 We had an amusing episode of ‘find the mother in law’; Hampshire Federation contacted our WI because their Vicar had revealed his mother in law was a WI member in Steeple Aston. Determined to discover her identity, we made an announcement to our members and the mystery was solved – Ta Da! Janet Coley’s face said it all, applause all round! Further to the theme of link ups we have a group from Potton End near Hemel Hempstead coming to us again this year, for our now renowned ‘Ploughman’s lunch’ and village walk-about, we certainly know how to impress our guests! If you would like to join us at any of our meetings please do give me, Merrill Bayley a ring on 01869 347802 or email mjb16@talktalk.net and I’ll arrange an invitation for you. Christmas festivities for the WI started early this year. The Christmas market in Winchester on 30th November was a wonderful start to the Christmas season. It was a beautiful, sunny, and cold day which greeted us on arrival. Over 100 stalls were available to kick start the present buying ahead of the Christmas rush, all very close to the Cathedral and a short stroll to the city centre. Our Christmas dinner followed shortly on December 6th. The committee table is pictured here. We dinned exquisitely, thanks to a wonderful meal prepared for us by S&J Catering. 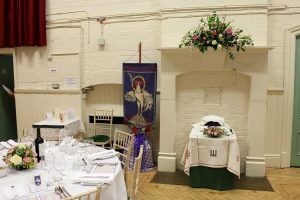 The Village Hall was transformed into a beautiful Christmas dining room and entertainment was provided by Peter Wentworth, a member of the Magic Circle. His tricks amazed and delighted us. More than once we asked, ‘How did you do that?’ Alas, he is sworn to secrecy and would not reveal how he accomplished his magical tricks. A few days later, on December 8th, we went on an Oxfordshire Federation WI organised bus trip to Richmond in time for lunch and further Christmas shopping. The highlight of the trip, however, was our night-time visit to the Royal Botanic Gardens at Kew to experience the seasonal illuminations. The paths, trees and the magnificent Victorian greenhouses were all illuminated. The paths all lead to the Palm House and lake where a fantastic and colourful light show was projected to both. 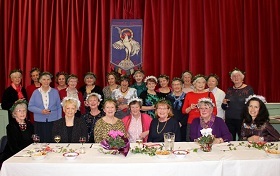 This was certainly another magical experience for members of the WI to enjoy in December. To finish the Christmas season, the North Ploughley Group organised carol singing, followed by refreshments on December 15th at Bucknell Church. What better way to gather around and continue celebrating the holiday season. At our first meeting in 2017, on January 10th, we will welcome Peter Hague who will talk on West Wycombe Park and the Dashwoods. New members are always welcome to join us, each second Tuesday of the month, and enjoy our excellent speakers, tea and cakes. We wish everyone a Happy Christmas and a wonderful New Year. To see more photos of the Christmas dinner, please click here. Our November meeting was chaired by Julie Hillier, who gave us an update on recent events and items, including some good news that Steeple Aston WI had won the cup for their three flower photos entered into the competition, and a photo taken by Janet Coley is to be used on the new OFWI calendar. The guest speaker was artist Brian Marshall, who gave an inspiring talk about his watercolour painting, interspersed with a variety of colourful demonstrations. He explained how he came into art, from working as a stand-up comic on cruise ships, to later finding an opening to take art classes for passengers. It was interesting to hear some of the early history of watercolour, when first discovered around 40,000 years ago in caves in France, prayer books illustrated by monks in the 15th century, and the work of Durer, and later, Turner. Through his demonstrations, Brian was able to convey aspects of rural scenes with a variety of deft brushstrokes, as well as various washes, including a ‘Turner sky’. This all made for fascinating watching! On Remembrance Sunday some members joined the procession and the poppy wreath was placed on the war memorial beside the others. This year’s panto night at Chipping Norton on the 16th was great fun with an excellent cast of adults and children, and ‘guest’ appearance of a rather scary but realistic, certain new president! Events to look forward to in December include a visit to a Christmas market as well as Kew Gardens, and the Christmas gathering on the 6th December. 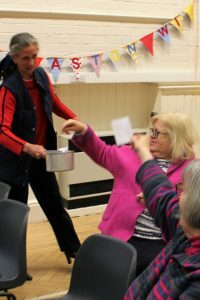 Another busy fund raising session for our Denman Collage at Marcham, Julie Hillier came up trumps again, this time impressing us all with her soup making skills! No fewer than five different varieties of soup to warm us up after an enjoyable and informative walk led by Jane around our village and up to Middle Aston to regale visitors from other WI’s about our local history. Our Tuesday our meeting was thrown into disarray when our booked speaker cancelled in the morning! I was in the process of building up to having an exciting meltdown when I espied a potential speaker walking along South Side – I duly drove forth to waylay him, blocked the passage for the bus and ended up having to drive onto the pavement! But I had succeeded in collaring none other than Christopher Compston, (pictured here in his robes) who very kindly agreed to speak to us about his days at the law courts. Not only did we learn about the changes at law, but there were some anecdotes about judges and jurors that were quite hilarious! We were delighted to welcome our guests one of whom joined up on the spot! For our 8th November meeting we go all arty with a Water Colour Demonstration and talk, this sounds very much like an occasion to bring out all our creative members, and those who wish they were creative, so just enjoy seeing what others can do! 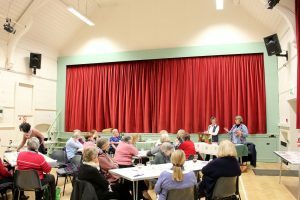 Our WI has a very busy month with two invitations to other local WI’s within our group, one to support a fund-raising for Denman involving a bingo session. The main one will be entering the three winning photographs of flowers, which were voted best of the bunch on Tuesday – these go forward to represent Steeple Aston WI and will be judged against undoubtedly stiff competition. If you would like to join us at our November meeting give me, Merrill Bayley a ring on 01869 347802 or email mjb16@talktalk.net and I’ll arrange an invitation for you to join in. To see the photographs, and more pictures, including a letter from the Queen, please click here. What a super evening our September meeting turned into! Dr Sally Crawford, pictured here, held us spellbound on the edge of our seats as she lured us into the strange comings and goings of Professor Paul Jacobsthal a fellow of Christ Church. He was a member of the Oxford Philological Society; nicknamed The ‘Bund’ by him and his fellow German refugees. The trail remains unresolved, was he or was he not a spy? Why were official documents redacted till 2031, why are some tracts of documents still censored? Yes indeed we want to know more, Sally has promised to keep us informed if any other documents are found which could shed a little more light on this on-going chronicle. The artefacts many of us had brought to the meeting – well stuff we have dug up from our gardens over the years, these were laid out on the table for our ‘Time Team’ to examine. The Team had grown to four archaeologists: our two WI members Janice Kinory eyeing up the pottery as her area of expertise is prehistoric ceramics and Priscilla Lange specialising in animal bones; Dr Sally Crawford, covering medieval and archaeology of childhood and Sheila Raven an expert on finds. Bones from one garden alone yielded cattle (from a discarded wing rib of beef methinks) a pig bone, just one horse tooth and the mandible of a sheep. Also found were C17 onion jar of thick black glass that was in fact a wine bottle apparently of Dutch origin, found in the allotment. A miniscule silver thimble, a small doll’s leg ¾” long, pieces of china, a bottle top, clay pipe stems and even a Victorian dress ring. From further afield a lump of slate from Wales with numerous cut markings on it; a ‘tally board’, fossilised shells from N Wiltshire included a wild oyster and ‘devil’s toenail’ and a piece of sea urchin/coral from the Cretaceous period. Thanks to Catherine Crook who ran our WI stall on Bank Holiday Monday Flower Show day – and thanks to everyone who supported us on such a lovely sunny day! If you would like to join us on our 11th October meeting which is all about buying and selling at Car Boot and Antique Fairs, please give me a call – Merrill Bayley 01869 347802 or email mjb16@talktalk.net and I’ll arrange an invitation for you to join us. Here we are at the end of the beginning – that means we are in the middle – it has been the quiet month of August, reflecting on the past very busy few months and anticipating the probably even busier run into the autumn. 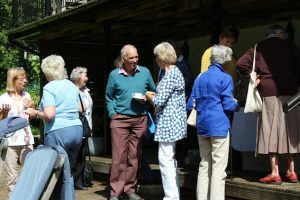 We had a very successful Denman Day fund-raiser in July, a garden party on a sunny day with coffee or tea and some delicious Pimm’s with amazing raffles and an auction for Pear Trees! We also fitted in an evening social pub supper, and at the end of August we had our WI stall at the Village flower show, pictured here. Our July meeting was without doubt our busiest meeting this year with loads of potential new members willing to give us a try – and indeed we already have some new members joining from that meeting alone! However, we are never complacent and the September meeting will give those – what did I call them – hesitators and fence sitters, the chance to join up with all appropriate gusto! I will be inviting those few who were unable to attend in July to come along. Our 13th September meeting promises to be a humdinger of an event, with Dr Sally Crawford regaling us with more about the ‘Unlikely Pimpernel’. We also have our own ‘Time Team’ style of no less three Archaeologists, one specialising in bones, and the others cover anything interesting dug up from your garden that you can easily carry! This is full audience participation for our members and our invited guests who may bring with them their artefacts and the team will be available to identify and date and authenticate them! If you would like to join in on our September meeting give me, Merrill Bayley a ring on 01869 347802 or email mjb16@talktalk.net and I’ll arrange an invitation for you to join in. 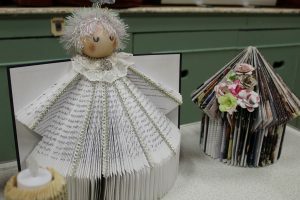 For more photos of the WI at the Summer Show, please click here. 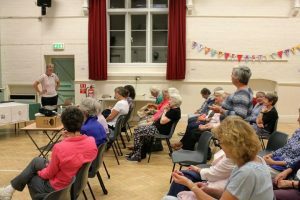 At our July gathering we were delighted to have some guests joining us for the evening, to get an idea of what the WI is about and relax over a glass of wine. The tea and coffee ladies made a supreme effort to provide extra delicious sweet treats. We hope our guests had fun and enjoyed their visit. After a period of mingling amongst the group, Merrill started off the meeting with a few topics. For the benefit of those who did not go on the June trip to Stratford, Mary gave a summary of the visit; a pleasant reminder of a great day out. Veronica Wilson put forward a resolution to create a central register of expertise. This would be available for all members nationwide to tap into when writing resolutions on particular topics, many of which can be sensitive issues. The resolution was put to the vote and passed unanimously. The speaker for the evening was Chris Caddy (pictured), who gave a comprehensive history of the London tube, and showed us some interesting archive photos. He informed us that the map we have now was designed by an electrician, which accounts for why it resembles a circuit board. 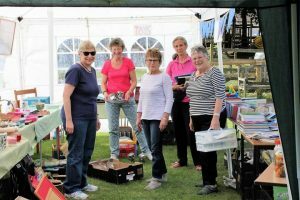 The WI marquee will be in its usual spot at the Flower Show on 29th August, selling cakes, books, bric-a-brac and chutney. We hope to see you there! My missive of the long, wonderful, wondrous, wandering, winding, wet walk! This particular WI walk of Jane’s was described thus: “Mystery” walk on Friday, 24th June. It will be approx. 4 miles long and there are 5 stiles. It will be a mystery to me, too, (I read about it in a book of walks). Here’s hoping we don’t get too lost! This is a complete departure from the usually fully prepared and pre-walked ventures. Perhaps we should have smelt a rat as there were two drop outs at the fairly last minute – what did they suspect I wondered! This left just Julie Smith and me (Merrill Bayley) and of course our intrepid leader Jane Johnston. Jane was cheerful and optimistic as we left the shop very promptly by 10.00am and were driven to the car park at Great Tew. Jane consulted her little map (see above) and off we headed up the roadway we had just driven down, however this did not yield the required ‘gap in the hedge on our right’. So after a while we walked back down the hill and fortunately Julie spotted the gap – in fact two other walkers had also missed the gap and we were able to call them back to the ‘secret’ entrance. Amidst grateful thanks etc., we found that one was from Aberdeen and the other from Oxford – we led them up the hill to the first easy gateway down a roadway in the direction of Little Tew, all went well for quite a while and we lost our retinue and forged forward; our merry little band of three. Past the Church of St John The Evangelist then something happened, the map referred to a left turn after one mile by The Lodge, but we presumed we had covered the said distance and headed off down a promising path way, but after further consultation this time of the Ordinance Survey map it was declared the ‘wrong way’ so back we went onto the road and did at least a mile or so and verily there was, The Lodge so off we strode again, but Jane was not happy that the route was correct, again some retracing of our steps and consultation with the OS map ensued. Plain sailing for a very short distance, surely too easy, sure enough we found ourselves going alongside the Soho Farm Project and signs abounded ‘Private’, ‘Please take this route – permissive footpath is an alternative to the public right of way’ etc. Sometimes the arrow pointing towards a field that appeared to have no discernable path. The map and the footpath now were at variance and caused us a lot of confusion, we were however forging on now through a tented area. Tents with chimneys, surely not a Boy Scout jamboree – surely these were ‘glamping tents’ with Adirondack chairs in various colours outside each entrance. The whole area was covered not with wet dewy grass, but dry crisp wood chips! What manner of encampment could this be, clearly not for hordes of incoming refugees we decided! We spotted a chap working a little way away and duly consulted him about the route we were hoping to be on. ‘Not this way’, said he, go back to the fenced pheasant area and take the gravel path. Then his colleague arrived and also gave directions. We retraced our foot-steps back through the camp site and found the unmarked gateway with no public footpath signs, but clearly this was the route suggested, we plodded on, oh, and then it stared to rain. Once again the signs showed arrows – but still we were off the map route – again and again we walked on to have a look-see and then retraced our footsteps. Then proceeding towards a gate we came to another encampment – but these dwellings were made of corrugated iron – with identical green bicycles outside some of them. Now where were we? More of these dwellings some made of wood now we knew we were in the Soho Farmhouse encampment – tennis courts in view, manicured lawns and newly planted woodlands. We were lost from our intended pathway but knew exactly where we were, but were unable now to extract ourselves from it except by walking down to the main entrance and out onto the road. Ah did I mention it was raining; well now it was quite a bit, actually it was raining pretty hard! Julie sported an umbrella and Jane and I had ‘waterproof’ jackets with nifty hoods. We strode out of Soho Farmhouse and up the hill, up a single-track road with passing places – some cars slowed down so as not to drench us, others like the Range Rovers just sped by and we stepped up the banks to escape the splash factor. The Maserati, Aston Martin and Porsche drivers were a little more inclined to slow down – for which we gave thanks. As we continued up the hill squelching through the running water, another brief look at the OS map and Jane confirmed another mile and a half to the pub. Oh the joy of that sentence was music to our ears and the toil to the top of the hill to the T-junction went quite quickly, however at the top of the road – naturally no sign posts, was it left or right, I fancied the left turn for no particular reason, but it in fact turned out to be correct – OS said turn left and so we did and then the absolute relief to discover we recognised exactly where we were and just down the road and round the corner was the Falkland Arms. We were just in time; the kitchen was due to close, lunchtime ended at 2pm we made it with less than 20 minutes to spare. We downed nearly a bottle of water before imbibing on some alcoholic beverage and congratulated ourselves on having made it, safe and sound yet very wet. We enjoyed a delicious meal, in a nice warm and dry environment – what more could one ask for! Thanks Jane for the most mysterious walk we have ever had! This one is for the record books for sure, a mere 4-mile walk increased by at least 2 more miles! Jane said the next walk would definitely be a tried tested one! Tuesday, 7th June was our annual summer outing; this one to Stratford upon Avon, home of the Bard as would be appropriate on this centennial year! One of our members generously and anonymously, covered the cost of hiring the coach, so we were collected from the Village Hall and neatly deposited directly outside the RSC Theatre. A glorious day saw us all sauntering around, enjoying a coffee break overlooking the river before boarding the Countess of Evesham narrowboat (pictured here) for a leisurely glide along the Avon whilst imbibing our various favourite tipples and enjoying a rather excellent meal. Some of us spotted the heron by a weir and we were periodically escorted by flotillas of swans for our gentle journey through the lush landscape of Warwickshire. After disembarkation we had a final opportunity to indulge in retail therapy or seeing Will’s school, the museum etc. There was of course someone who was late getting back to the bus – err me! The May pub outing was to the White Horse at Duns Tew a rather splendid old pub with jolly good fare where eleven of us enjoyed an excellent luncheon. Our next pub outing will be an evening session – yes we can accommodate our members who are still working! July 12th is our next meeting and we will be having lots of visitors to an open evening for potential new members to come and see for themselves what is on offer at Steeple Aston WI over a little glass of wine. For newcomers to the village a chance to get to know people and make new friends, for the hesitators and the fence sitters, they too can find out what a friendly and fun bunch of ladies we all are. If it is not fun to do then let’s not do it! The WI is what YOU make of it, there are opportunities to learn so much more than the ubiquitous classics (craft, cooking and sewing). 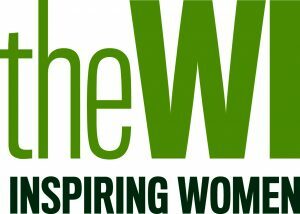 Not only do we have speakers from all walks of life coming to us, we in Oxfordshire, are privileged to have the WI’s Denman College at Marcham on our doorstep. Courses are run such as creative writing, history and heritage, computer skills, and many, many more. Oh, and we do go out for the odd pub lunch after a mornings’ brisk walk in the hinterlands nearby. If anyone else would like to join us on July 12th give me, Merrill Bayley a ring on 01869 347802 and I’ll tell you all about it. For more photos from Stratford, please click here. Our May meeting took place on a balmy spring evening. We always look forward to this meeting as it’s one of our two used book and magazine sales, the other being in October. It’s a good time for members to stock up on bargain reading material for their holidays. It’s also the time of year that we consider the proposed action resolutions for the AGM of the National Federation of Women’s Institutes (NFWI), to be held at Brighton in June. The NFWI has two resolutions for consideration by its members this year. One was a proposal to authorize the organisation to lobby supermarkets to voluntarily give surplus food to charities, cutting food waste and reducing food poverty. The second proposal was a request that NFWI lobby HM Government and the NHS to provide facilities for carers of Alzheimer’s disease and dementia patients to stay with them when they have been admitted to hospital. The members discussed the resolutions fully, then voted, as pictured above. The first resolution was accepted, the second was defeated, largely due to concerns that the proposal may not be the best, only or most cost effective solution to the problem. Further, as a result of our discussion, we knew that the NHS was already beginning to do more training with its staff to raise awareness of the issues that arise when treating patients who have dementia in addition to the medical problem which brought them to the hospital. Our president, Merrill Bayley, will take this information with her when she attends the AGM and vote according to the wishes of our members along with those of the other 215,000 WI members across England and Wales. 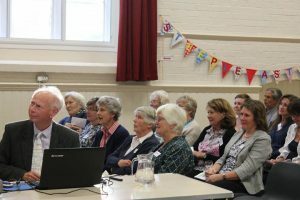 Our May meeting speaker was Mary Gregory from the Oxford Federation of Women’s Institutes and our local representative for the Associated Country Women of the World (ACWW). 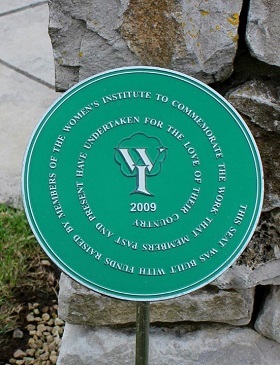 We learned about the history, structure and charitable goals of this organisation which has been supported by the WI since its inception. It was a stirring talk that helped us remember that the WI isn’t just about our own village but is a link to a much wider world. Our June meeting will be our summer outing rather than a talk at the village hall. 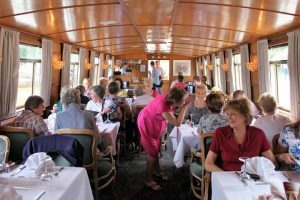 We’re off to Stratford-on-Avon on the 7th June for a boat trip and luncheon on the Countess of Evesham on the River Avon. We are happy to tell you more about the WI in Steeple Aston so do contact any one of us or myself: Janice Kinory on lotsofbirdz@aol.com. April is the month that we hold our Annual General Meeting when we listen to our esteemed office holders – president, secretary and treasurer – give their reports. Merrill, our president, started the ball rolling by thanking just about everybody individually for their support over the past twelve months. There are several non-committee members who willingly take on duties and run activities for our members. Each person mentioned took a bow and was applauded with much laughing, bowing and general ‘overacting’! Nobody in our WI is taken for granted. Our secretary, Janice had such a lengthy report to give that she had previously emailed out to all members to read beforehand in order to save the risk of putting us all to sleep (or so she thought)! Linda, our treasurer, even managed to make something as dry as a financial statement fun to listen to. A special presentation was made from the committee to Isabella Cleaver who is stepping down as a committee member after seven years of service! Isabella will, of course, remain a member in the WI. The speaker for the evening was Jane Finnerty, a WI Adviser who came to outline the work done by Dementia Friends. She acknowledged that the subject could be very confronting as we all either know someone personally or have some experience with this tragic and until recent years, taboo disease. Jane kept her talk very brief and we played a light hearted bingo quiz to finish. We won two boxes of chocolates that will be raffled. Mostly our members chose to speak to Jane and share their stories on a one to one basis which was much appreciated. Jane was very complimentary on our up-beat approach to the meeting and stayed to enjoy a cuppa and a sumptuous array of cakes provided this month by Julie Hillier and Jill Vallis. On Friday 15th April you may have seen this large group of ladies walking around the village, stopping here and there to view points of interest. 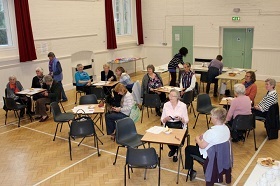 It was Potten End (Hemel Hempstead) WI being hosted by our WI. We hired the Sports and Rec Hall and provided a delicious ploughman’s lunch afterwards. The ladies thoroughly enjoyed themselves and thought our village was beautiful (which we know full well!). We look forward to joining them in their domain in the near future. Our meetings are held on the second Tuesday of each month in the Village Hall, at 7.30 pm. Our next meeting will be on Tuesday 10th May. The speaker will be Mary Gregory who represents OFWI in supporting the Associated Country Women of the World – Pennies for Friendship, which aims to improve the standard of living and education for all women and their families, internationally. We are happy to tell you more about the WI in Steeple Aston so you can contact any one of us or myself: Catherine Crook 01869 340387. For lots more photos, please click here. Spring has sprung and our members have had a busy month taking part in a variety of activities and celebrations. Not least being our annual WI Birthday Night. This year Steeple Aston WI is 98 years old! We try to find some way to mark our March meetings with something a bit special – this year we did it in style with a demonstration of Malaysian cooking by Yolanda Tapping, followed by a buffet of the food that she had cooked. It was delicious and our members showed off their chopstick skills with aplomb! On February 28th, we joined forces with the Village Litter Pick to Clean for the Queen and thoroughly cleared Sixty Foot. It was a brilliant, sunny day and we felt satisfied with a job well done. How sad to see that already now there are discarded drink cans strewn along the grass verge! 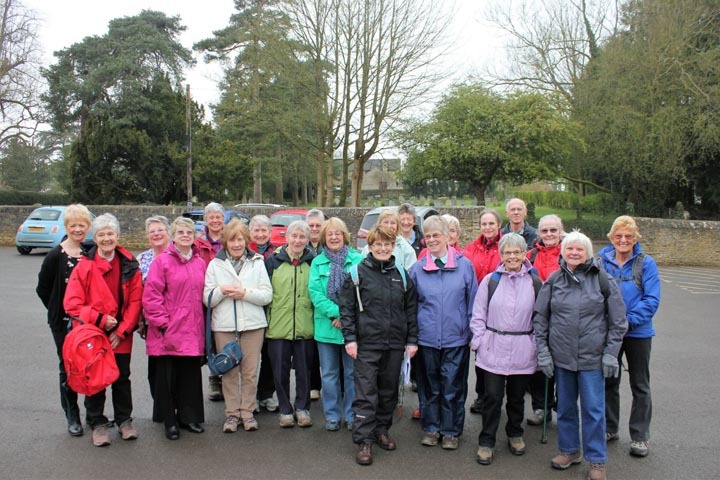 On a brighter note the recent misty mornings marked a change in the weather – but whatever the weather there are always a few hardy individuals who regularly take part in Jane Johnston’s walks. Blenheim Park is a favourite when it is muddy underfoot as we can walk miles along and around the wood and lake on firm ground. We reward ourselves with a pub lunch – this time at our local Red Lion. One of our members tried out Mel and Sarah’s new beer ‘Ryecatcher’, which smelt good, tasted good and by golly it did her good! Our meetings are held on the second Tuesday of each month in the Village Hall, usually at 7.30 pm – however our next meeting will be our A.G.M. on April 12th and will start at the earlier time of 7pm. The speaker will talk about ‘Dementia Friends’. Do come along – we love to welcome guests and potential members. Since our last report the weather has changed from interminable rain to lovely crisp mornings. What a relief! Undaunted and indomitable our intrepid walkers were glad to clear the cobwebs even on a wet and windy day in January. The walk around Blenheim took in the lake and the wooded path which is quiet and a good place to bird-watch. We warmed ourselves afterwards at Sturdy’s Castle. 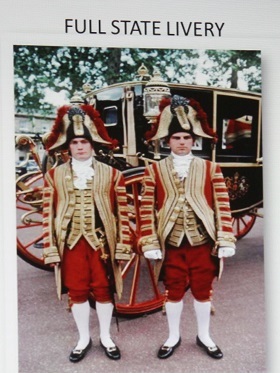 The speaker at our last meeting, Ian Scott-Hunter, (pictured here on the right) talked about his Life as a Footman to the Royal Family. An amazing story that started with the birth of his daughter over 40 years ago. She was born with brain damage. Ian and his wife, Rachel, had to move from Wales to London to access Great Ormond St Hospital. He needed to find a job quickly – and – as luck would have it he heard that there was a job going as trainee footman at the Palace. He nervously went along for an interview, and the rest, as they say is history! He amused us with anecdotes from his time as footman and it was obvious to us that his modesty and grace served him well in his role over the many years. He ended by showing us a photograph of his daughter celebrating her 40th birthday – another amazing journey. We have a little under 2 years to plan for Steeple Aston Women’s Institute Centenary in 2018. 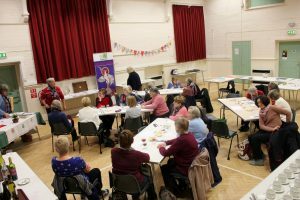 We will be the first WI in Oxfordshire to reach 100! It is with great pride that we will be honouring the work done by women in the village who have met every month for one hundred years – incredible! As it happens the business of the evening included nominations for the committee – a vital role will be played by its members in the next two years and thankfully we had plenty of nominations. Our meetings are held on the second Tuesday of each month at 7.30pm in the Village Hall. Our next ‘open to visitors’ meeting will be our A.G.M. in April. The speaker will talk about ‘Dementia Friends’. For our members only – on the Tuesday 9th March is Celebration Night with Yolanda Tapping who will demonstrate Malaysian Cookery followed by a Buffet. For more photos please, click here. At the time of writing the weather has changed from interminably wet, grey days to the promise of cold, sharp clear days that will, with any luck, stop my lawn (and mould) from growing! Speaking of promises for the year ahead, the current program continues until April and our program planners, Pauline Brock and Mary Rushworth have worked their magic and selected some fantastic speakers and activities for 2016 – 17. Watch this space! We were particularly pleased that the speaker at our last meeting boosted numbers as well as attracting two visitors who may join our WI. Brian Lowe spoke to us on The Oxford of CS Lewis and kept us enthralled with his knowledge, not only of CS Lewis but his family and academic contemporaries. Lewis’s Chronicles of Narnia are known and loved around the world. His appearance belied his intellectual prowess and was described by one of his pupils, John Betjeman, as smoky, tweedy and jolly, probably because of his other ‘academic’ study of beer! This alternative study was carried out with other Oxford intellectuals who adopted the name ‘The Inklings’. They frequented the Eagle and Child, which has kept the room as it was in the days of the Inklings. If the pub ran out of beer then they simply decamped to the Lamb and Flag across St Giles. The business of the evening included voting for resolutions to be taken to our National Federation for consideration; drawing two lucky winners for bursaries to attend a Day at Denman College – congratulations Julie Hillier and Angie Allen; a collection of knitted items collected by Jane Johnston ready for posting to “Knit for Peace” and also, by Jane, a date saver for one of her ever popular walks. Jane’s walks are indeed so popular that two of our members who are currently overseas in the Caribbean and Australia have emailed their intention to be back in time to take part! The business done for the evening we enjoyed a cuppa and a piece of Pauline Beadman’s delicious cake. 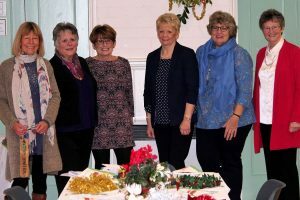 December is always a busy month for the WI and this year was no exception as our various activities and events rounded out the Centenary Year nicely. We thoroughly enjoyed our trip to Chipping Norton where we feasted at Whistlers prior to being entertained at the theatre with this year’s panto’, Robin Hood. Audience participation is an important part of the time-honoured custom and we gave it our all. We were amply rewarded for our efforts with a shower of chocolate pennies raining down on us from the stage – some of which we didn’t find until a few days later hiding in the folds of our coats. Although the WI is a secular organisation we do like to hold our Christmas Carol Service in a church. This year it was Stoke Lyne’s turn. Afterwards we were treated to a cuppa and delicious cakes and biscuits for which the WI is renowned. Several hundred WI members from around Oxfordshire enjoyed a good sing along when they attended the Oxford Federation Christmas Song Concert at Oxford Town Hall. Also provided at this event was a glass of wine, a mince pie and the chance to shop for gifts at stalls set up by the Federation. A coach trip to St Albans gave some of our members another chance to get their Christmas shopping underway, as well as visiting historic sites and the cathedral. Isabella Cleaver ran a Christmas Wreath workshop ably assisted by Linda Needle. Our finished items helped grace the tables for our annual Christmas dinner, pictured above. Our guest for the evening was musical director, Jenni Matthews – wow! she really brought out the X Factor performances from our members with rousing renditions from the Sound of Music and Evita. What a way to end our year?! Now we look forward to 2016 and our program gets underway on the 12th January with Brian Lowe speaking to us on the topic of ‘The Oxford of CS Lewis’ – visitors are most welcome. We are happy to tell you more about the WI in Steeple Aston so do contact any one of us or myself: Catherine Crook 01869 340387. Our membership had a full and varied November, starting with the Village Remembrance Service on Sunday the 8th. This year we paraded our banner alongside the Brownies and the Royal British Legion. The weather held which enabled us to walk our banner to the War Memorial. Trish Vickers, pictured here, was our banner bearer and Merrill Bayley our president laid the wreath. It was, as always, a moving ceremony. On the 10th, as promised, Valerie Calderbank gave us a very informative ‘Tour of the Universe’. Of particular interest was the Orion Constellation that contains the well-known star Alpha Orionis aka Betelgeuse, shining so brightly yet doomed to explode as a supernova, leaving behind a neutron star. Our members were also given the opportunity to peruse our Memory Book spanning 1983-84, beautifully covered with a needlework image of Steeple Aston. On the 13th, Linda Needle (treasurer) and Merrill Bayley (president) were invited to the Pre-School to judge the ‘best cake’ baked to raise funds for Children in Need. As is usually the case with such things it was so difficult to decide on one winner that two cakes took first place! Later that same day nearly half our membership arrived for lunch at the Jolly Boatman at Kidlington. We love to get together informally from time to time and what better way than over a pub lunch. Future events include a trip to Chipping Norton for the pantomime (this year Robin Hood) – always a popular event on our calendar and lots of fun. Stoke Lyne WI are running a Craft and Coffee morning on November 28th in Stoke Lyne Church from 10am – 1pm, all welcome. We will be attending our Group’s WI Carol Service held this year on the 10th at Church. Then on the 30th the Oxford Federation will be holding the annual Christmas Song Concert at Oxford Town Hall. And in order to fill up those stockings a coach is taking us to St Albans Christmas Market. In December Isabella Cleaver will be running a workshop on the 5th for members to make our own Christmas Wreaths and then we round off this busy Centenary year with a members-only Christmas dinner on the 8th with entertainment laid on by Jenni Matthews and her Singalong Showstoppers. From all of the WI members and the committee we would like to wish everybody a joyful Christmas and happy New Year. Our monthly speaker was Barbara Hately. It was a revelation to her when researching these women, and to us, that they were awarded equal pay upon completing their traineeship. Although they lived on board and did not have travel expenses (making their pay quite attractive), the living conditions were cramped and the work was physically very hard. A modicum of training was given but they learned mostly on the job. They were given a badge but no suitable uniform was ever allocated so off they went to the local army and navy store. Many of the hundreds who applied did not stay the course and even those who did remain found some of the manoeuvres hair-raising – especially ‘breasting up’ where two long boats were tied side by side to go through the bigger locks. There were some young women who did not pull their weight and soon gained the nick-name, ‘Dresden Chinas’. 35 women did stay the course, worked hard alongside the existing families and were well respected. However, even though some wanted to remain in the work after the war the Waterways and government of the day declined their requests. This precis only covers the basic outline of Barbara’s talk. We thoroughly enjoyed her presentation and the archival photos she used. The remainder of the evening included perusing one of precious Memories Books. Each month Julie Smith (custodian of our archive) brings along one of our books. This month we looked back 50 years to 1965. Jill Duncan who is still a member was president then. Our guest speaker judged the monthly best flower to be Libby’s lovely pink and cream striped rose bud. We also ran an apron competition in preparation for our North Ploughley Group Meeting later this month which was won by Catherine. will be walking from Larkrise to Candleford; our Sit & Stitch group will get together; and those who love to lunch will meet at the Jolly Boatman. There is always something to put on calendars. Our speaker next month is Valerie Calderbank who will give us ‘A Tour of the Universe’. If you are at all interested we do recommend that you come along. Visitors and their partners are most welcome. Our next meeting is on Tuesday 10th November at 7.30pm in the Village Hall. If you want to come along or you are interested in becoming a member then please contact me on 01869 340387. We can arrange for someone to accompany you if you wish. Our celebration was planned for the 8th September, our speaker booked, and the gift wrapped and ready. But – our speaker cancelled. This gave us a wonderful opportunity to re-think the evening into something rather more special. The committee kept everything top secret from the rest of the members, until they received the flyer pinned to the front of the News & Views, which we deliver to each of our members. We tempted them with “All changes for September we are celebrating 100 years of the WI. 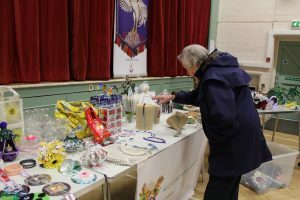 We started the evening by greeting our members as they arrived, and encouraging them to browse and of course to buy from the vast array of items on the long tables. We had arranged the seating for them of four chairs to each table and these were duly covered with tablecloths, on which nibbles, napkins and even the words to Jerusalem were carefully arrayed. 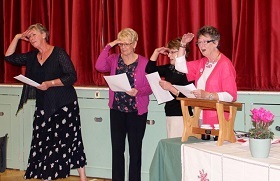 The members were stage directed a little more than usual as they were asked to remain standing to sing Jerusalem (this was the first time our WI had sung this for a number of years) and they all sang at full throttle! I then went on with the usual business – and informed the surprised members that four of the committee would entertain and amuse them with a sketch! Catherine Crook, Pauline Brock, Mary Rushworth and I (pictured above) sang ‘Four girls bright and beautiful’ (to the tune of “All Things Bright & Beautiful”) with all the hand gestures etc, to much laughter. This was followed by an excellent quiz compiled from various sources by Mary. The reactions spanned from squawks of despair to satisfied purrs of satisfied purrs of certain knowledge. The winning two tables were awarded (kids size) fingers of chocolate received with as much enthusiasm as if they had received a trophy each! The other sketch was performed by Catherine and Pauline (unrecognizable!) playing Flo & Lil dressing up with aprons, cardigans with safety pins, scarves and hair rollers to the great amusement of the members who thoroughly enjoyed the humor of this dated yet timeless anecdotal skit. I then thanked the actors and announced that the committee members would now bring in glasses of wine, and soft drinks of course, in order that we could make two toasts. This of course confused our audience even more! With wine in hand I asked the members to rise to their feet for the loyal toast – to Her Majesty the Queen who tomorrow will have reigned longer than Queen Victoria – The Queen! Before they had a chance to sit down I then called the toast to the WI being 100 years old – The Women’s Institute! I then bade them sit down and await the surprise gift from the committee. Along came the prettily packaged bags with each members’ name on the tag. There was a buzz of excitement as they realized that contained therein was a book it was in fact their very own Recipe Book. We had asked every member for their favorite recipes at the end of last year, I had even chased up a few late entries. One, Vera Jones, told me that she did not cook so had no recipes, instead I asked her for a favorite restaurant, a story about food or an anecdote. She agreed and you will find her entry on page 4. Sadly Vera died before the book was published, but we chose to keep her wonderful entry. Each member’s photograph (just a head) is set above her name with any anecdote about the recipe, Each photograph is identical in size taken of course by our own photographer, Catherine. The members had an opportunity to view the photos to ensure they were happy with the one selected. Most members had produced more than one recipe so their photo will appear more than once. This style of cookbook we believe makes our book absolutely unique. The smiles on their faces as they opened their packages were of incredulity – oh yes! they remembered passing in the recipes but thought nothing would come of it!! Surprise, surprise this book is ring bound and professionally printed, each recipe is shown on one page or across two pages, never needing to turn a page to follow a recipe in this book and we believe makes it somewhat unique! The gaps thus caused were filled with WI motifs. More wine followed then as per usual tea and coffee with some lovely birthday fairy cakes baked by Pauline and biscuits by Catherine this rounded off the festivities. The Raffle tickets were drawn by our guest; a potential new member, and prizes handed out to the three lucky winners. I then took the opportunity to thank Janice Kinory (our secretary) who had done mammoth task of collating the recipes, checking, correcting, sorting, etc., helped with proof reading by Isabella Cleaver. Catherine assisted with the graphics. A bottle of wine was duly presented to Janice to show our appreciation of her very hard work. This to much applause! I then asked all our members to rise one more time this time to sing the National Anthem, this was sung with due reverence and great gusto. I finally declared the meeting well and truly closed and the committee set about clearing up, washing the glasses and plates, folding tables and chairs and putting them away – helped by some of our stalwart general members. That was one heck of a celebratory meeting!! Although August is our official holiday month we have still had plenty to involve ourselves with. Firstly, as the title of this article suggests, the WI Oxfordshire organised a trip to the National Memorial Arboretum in Staffordshire. Trish Vickers and I went along and found tributes to men and women from all sectors of the community. Specifically, facing the river with a natural meadow behind, a rather beautiful stone seat built with funds raised by the WI to commemorate the work that members past and present have undertaken for the love of their country. The plaque is pictured here. Should you ever venture north it is well worth a visit. For those of us of a certain age a trip to an Elvis Expo at the O2 in London, was a trip down memory lane! Yes – the WI do let their hair down! Costumes, cars and classic Elvis music were all on display along with many photos, recordings and footage of the ‘King’ from his earliest days as a young, blonde, lanky, schoolboy to the dark haired heart-throb of his stardom. 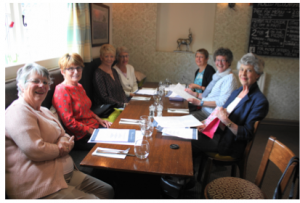 Our own WI had one of our regular lunches at a rather nice pub called the Tite Inn at Chadlington. Aptly named – but no – we didn’t over imbibe! We always try to find somewhere different and it is well worth going again. Another more local pub features next as some of us went to the Rock of Gibraltar for an outdoor theatrical event put on by Mikron Theatre, a no-charge troupe (donations taken) who put on a variety of short plays. We went to see ‘Raising Agent’, a rather funny take on 100 years of the WI harking back to its Canadian origins. Rather thrillingly for us, and quite by chance, Julie Summers (of Home Fires fame) was in the audience. Her book Jam Busters has become the hit TV series – with another series to come! Julie is well-known to the WI and she spent some time talking to us and letting us in on some TV-land gossip (my lips are sealed, Julie!). We are all systems go for our WI Stall at the village show on August 31st. Last year for our quiz you encountered a rather long snake skin! This year we have something equally reptilian to quiz you about. Also, for those with a sweet-tooth, you will want to enter the competition to win a huge jar of sweets. We have lots of wonderful things to tempt you with: costume jewellery, hand-made-crafts, bric-a-brac and of course bottles of home-made marmalade, chutney and relish – so do come along to support us and be tempted! As the Denman speaker cancelled, the committee grabbed the opportunity to make September’s meeting a very special NFWI Centenary night to remember! More details to follow – but come prepared to browse, buy and celebrate. The committee has a surprise in store for you, so do be there on the night! As our title suggests we have been busy since our last report. Denman College at Marcham belongs to and is run by the National Federation of Women’s Institute. The courses are open to members and non-members alike and offer an amazing variety of vocational courses all year round. Google Denman College and you will be astonished. 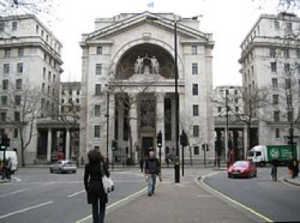 We are very lucky to be so close to this national facility as women from all over the UK book courses that can be short one or two day events or longer – up to one week. The beautiful house and grounds offer tranquillity to counter-balance the courses that include morning, afternoon and evening sessions. Recently three of us attended a special three-day Oxfordshire Federation weekend. Julie Smith studied the art of making all things cheese and filled two cool-boxes with her produce, Linda studied and made a beautiful quilted cushion and I attended lectures and visited London to learn all about the history of the St James area. There were many other courses also running and when we all gathered together for dinner we eagerly listened to each other’s experience. Julie re-visited Denman recently for one of their ‘free-days’ – this time sponsored by Vichy. Julie gave us a short overview of her day which made us all wish we had gone too – especially when she (pictured here) gave each of us a small gift of samples from Vichy! Our regular meeting was well attended with Lee Butler giving us insight into the Philosophy and Practice of Chinese Medicine. 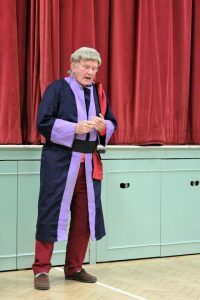 Lee was obviously passionate about his profession as he explained the need to re-examine some of the herbal traditions of England, which sit alongside and compliment Chinese herbal medicine. Needles of various lengths were held up for us to gasp at. Especially the one that goes into the Maximus Gluteus! Lee ended with a lively exchange of questions and answers and generously pointed out that he is always available to answer questions by text or by email without necessarily needing to book a session with him. Jane Johnston organised a tow-path walk from Aynho to Deep Lock Cottage. The weather was perfect as the seven of us chatted with many of the owners and holiday-makers on the long boats as we went along. We ended our morning as always with a delicious lunch – this time at the Great Western Arms. We do not have a meeting in August – instead we will be holding our annual sale of bric-a-brac and all things W.I. at the Village Horticultural Show. We will have our own literature and information on hand and we will be only too glad to tell you how exciting it is to be in the WI as it progresses and encourages women of all ages to embrace our modern fast-moving world. Come to the Village Show on Monday 31st August and meet our members, buy our goods and take part in our competition. Our meeting on the 8th September will welcome Jane Probits to tell us all about Denman College History and Courses. So do come along. Guests are most welcome. If require any information you can contact any one of us or myself: Catherine Crook 01869 340387. Since our last report we have had an amazing month: celebrating the National WI Centenary; celebrating joys of bluebells in the spring and celebrating the triumph of creativity over adversity. 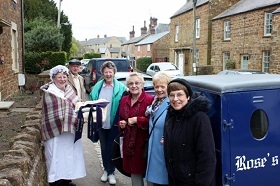 On April 19th the WI Centenary Baton made its way through our local villages (rather like the Olympic Torch) having already travelled much of the length and breadth of England. It’s pictured here carried by Linda Needle, with Merrill Bayley, Margaret Russell, Paulene Brock and Janice Kinory in attendance. Eventually it will be handed over to Her Majesty, Queen Elizabeth at the Albert Hall on June 4th. On a slightly smaller scale we enjoyed a lovely lunch at the White Horse, Kings Sutton. For those who are keen to burn off calories (or not), Jane Johnston organised a walk to the local bluebell woods – hoping that this year they would in fact be out! Jane had no need to worry as the bluebells performed beautifully and carpeted the ground under the trees. Our guest speaker this month was Keith Jansz a Mouth and Foot Artist. In 1995 a car accident paralysed Keith from the shoulders down. Unable to do anything for himself he fell into a deep depression. After being given a book about Mouth & Foot Artists, Keith was inspired. An introduction to Trevor Wells, who encouraged him to hold the artists brush in his mouth, gave Keith a new lease of life. Funnily enough the arrows that were bent by budding archers at Stoke Mandeville made great extensions for the brush. The result of his determination and natural ability is evident in his paintings in which Keith explores light, from a sunlit beach to the unique quality of light in Venice. Keith prefers to paint ‘en plein air’ to capture the most authentic effect, completing his paintings in the studio. As he says, it is important to paint ‘what your eyes see not what your mind thinks’. Keith holds solo exhibitions in the UK and his paintings have been exhibited in museums and galleries around the world. You can see his work at The Gallery in Oxford Town Hall from 6 – 13 June this year. We were inspired by Keith’s tenacity and modesty. It will be well worth viewing his work when he exhibits at the Oxford Town Hall in June. Our members will enjoy a garden party in June then at our regular meeting on 14th July our guest speaker will be, Lee Butler speaking to us on The Philosophy and Practice of Chinese Medicine. Guests are most welcome so do come along. We will be happy to accompany you should you require a lift. You can contact any one of us or myself: Catherine Crook 01869 340387. Congratulations to the SAL team on producing a beautifully presented 500th edition – well worth keeping as a memento. As can be seen from the archival photograph of the WI some things stay the same and some things (fashion & transport in particular) move on! April is the time for our AGM, Individual Flower Award and Social Quiz Night. The business for the evening got underway promptly and was not at all ‘long-winded’ as Janice (Secretary) had come up with the brilliant idea to email ahead the rather lengthy document that is our official report. This saved time and Janice didn’t have to ‘stand and deliver’. Isabella stood in for Linda and gave the Treasurer’s report. Voting then commenced and Merrill Bayley is now our President for a second year as are the members of last year’s committee with the office holders being Janice Kinory, Secretary and Linda Needle, Treasurer. We are looking forward to an equally busy and successful year ahead of us and we are always hoping to attract new members, encouraging guests to come along to our events to get a feel for our vibrant, fun loving and enthusiastic group. Margaret Mead won the Cup for Individual Flower – well deserved and based upon the number of times our monthly guest speakers have chosen their favourite bloom. Mary Rushworth was quizmaster for the evening and boy did she set hard questions! She was kind enough to give the teams extra time. It is clear we have some very brainy members and some ‘could do betters’! It was lots of fun and there was plenty of laughter at some of the answers. Our next meeting is on Tuesday 12th May at 7.30pm at the Village Hall. Our guest speaker is Keith Jansz the well-known mouth and foot artist. His topic is The History of the Mouth and Foot Painting Artists. Guest are most welcome so do come along. We will be happy to accompany you should you require a lift. You can contact any one of us or myself: Catherine Crook 01869 340387. We look forward to seeing you there. The Steeple Aston WI celebrated in style to commemorate the 100th anniversary of the establishment of Women’s Institutes in the UK, the first being in Wales (a point that Merrill, our president, is very keen to mention). We decorated the hall, set out a beautiful buffet (all the members contributed something), and Linda Needle made a beautiful birthday cup-cake tray, with obligatory candle, blown out by our member Sheila Side, to finish off our feast. Alan Brewer was our guest speaker and our sides were splitting with laughter as he entertained us with anecdotes of royalty and celebrity. Alan kindly drew the raffle tickets and eight lucky ladies took home a beautiful potted primrose. We also held a ballot to allow one of our members to attend the Royal Garden Party for the WI hosted by HRH The Duchess of Cornwall. One member from every WI in the country will be attending. The lucky winner of the ballot was Catherine Crook – completely overwhelmed and flushed with happiness! To round off the evening each member was given a commemorative beaded book mark as a special gift from the committee. Within a few days of feasting on our Birthday Buffet the walking group burnt up calories walking roughly four miles around the lake and woodland park the comprises Blenheim Palace grounds. It was a cold day but nothing that the group hasn’t faced before. The reward at the end is always a slap up lunch at a pub of choice. This time they repeated a visit to Sturdy’s Castle which is proving to be a popular place to eat. Our next meeting is our AGM and Social Quiz night held at 7.30pm on Tuesday 14th April at the Village Hall. You can contact any one of us or myself: Catherine Crook 01869 340387. For photos of celebrations and the walk, please click here. The ‘World is your Oyster’ or it certainly seems that way with so many activities to report on and to look forward to. So let’s get started. Eight of our members did not let the cold winter’s day put them off their chance to walk through Blenheim Park. They were rewarded by the sight of tufted ducks, swans, moorhens, coots and geese (wintering as they always do by the lake). Having worked up an appetite, lunch at Sturdy’s Castle recharged the batteries. Jane Johnston is our organiser and we are looking forward to another walk in March. Our meeting this month drew interest from three extra guests (always welcome). Merrill opened the meeting in the usual manner and then announced that the ‘Best Apology for Missing a Meeting’ must go to our newest member, Priscilla who is, as we speak, in Oman on an archaeological dig for the British Museum. Beat that! Merrill went on to award the prize of a box of chocolates to Hanny Nicholson for spotting the location of WI posters in the village. Our guest speaker for the evening, Chris Smith ADI, gave us his ‘Top Tips for Drivers’. (As if women need this!) His first tip was that anyone wanting driving lessons should be aware that PDI instructors are not actually qualified to ‘teach’ driving. Look for the Driving Standards Agency Badge in the window and make sure they are ADI qualified. He went on to demonstrate several driving tips using humorous stories. Those present, I’m sure, should now have much improved parking skills! Upcoming events include lunch later this month at the Masons’ Arms in Swerford and in April members will try out their swing at a ‘golf taster’ (cream tea is the lure!). Visits to the Jane Austen Centre, Bath, in April; Ludlow Castle, and ‘A Modern Day Farming with NFU’ in May are events to look forward to. March will be very busy for us as we celebrate our birthday with a buffet, raffles and local guest speaker, Alan Brewer. Later in the month we will play host to our North Ploughley Group of WIs. Our guest speaker will be Frances Benton telling us about ‘A Passion for Pearls’. Our meeting closed as it always does with a thank you to our guest speaker as well as an award to the member who brought the best single flower specimen. 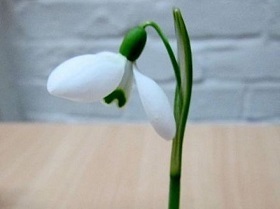 Of course – the snowdrop won! Delicious cake and biscuits were dished up with a warming cuppa by Julia and Hanny, giving everybody a chance to have a last natter before heading home. If you are interested and would like to come along as our guest please do so. Our next meeting is at 7.30pm on Tuesday 10th March at the Village Hall, featuring Alan Brewer and ‘Up in the clouds with some fluffy bits’. Sounds like fun! 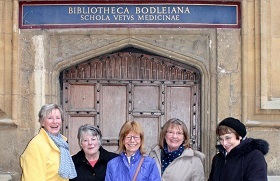 WI visited the Bodleian Library on 30th January to view the Dr John Radcliffe exhibition. Those of us who had visited the Bodleian last year to view the WWII exhibition, jumped at the chance to visit the Remembering Radcliffe: 300 years of science and philanthropy exhibition. Janice Kinory, our ‘resident archaeologist’ organizes these outings into Oxford and she did us proud again! She accompanied Merrill Bayley, Mary Rushworth, Linda Needle, Julie Smith, Isabella Cleaver, Angie Allen and Catherine Crook. We usually catch the bus into Oxford and this was no exception. We arranged to meet at the Bella Italia for lunch at 1.00pm and then go on to the exhibition. We all did our own thing before lunch – some went to shop, some did their business and Merrill and Catherine visited the Ashmolean to take in some art history. At the designated hour we met at the restaurant with discount vouchers in hand (always handy to get the very best possible deal when lunching out!). As it was a cold, raw day we enjoyed warming up over a lovely meal with plenty to chat about. We walked up to the Bodleian where we immersed ourselves in the various letters, legacies and lotions; prescriptions, philanthropy and privilege. We were all pleased not to have lived at a time when being unwell meant the very best possible ‘cure’ was to be ‘bled and blistered’! Of course the list only represents those buildings in Oxford! Although his profession was medicine his passion was education and there are people who still benefit from his philanthropy. We certainly benefitted from the short time we spent reading contemporary accounts of his endeavors as well as his own writings. Amazing and well worth a (free) visit as it still runs until March 20th. 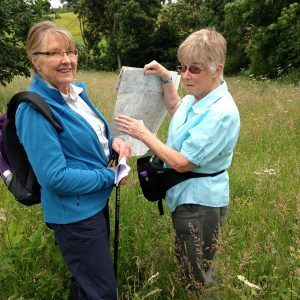 WI Walk on 30th January to Blenheim Park. Approx.4 miles on road surface. Meet at 10am at the shop corner. That was the invitation from Jane to lure us out on a cold winter’s morning! The roll consisted of; Jane Johnston, Judith Lane, Julie Smith, Isabella Cleaver, Pamela Waite, Mary Rushworth, Jill Vallis and Merrill Bayley. We rolled up at the rear gate of Blenheim Palace only to find this shut for repairs so on to the main gate and the big car park. Donned our boots and extra layers and strode off into the countryside ignoring the signs which read ‘Shooting in Progress’ as Mary assured us that the shooting had now finished, and it did seem remarkably quiet and the abundance of pheasants browsing in the various clearings bore testimony to the accuracy of Mary’s pronouncement! Stopping on The Small Bridge afforded eagle eyed Judith an opportunity to show her prowess at identification – some interesting looking ducks were spotted, and with her trusty binoculars she identified them as tufted ducks, black with white sides and tuft on back of head, this made a nice change from the usual mallard variety. We also spotted a pair of swans, some moorhens and of course the odd coot darting about. Later, as we neared the palace we saw some Gray lag geese, pink legs & orange beaks and snow gees about 8 and of course clumps of Canadian geese all around. The morning had been cold but bright and sunny but as we returned towards the Palace we were aware of some slight drizzle in the air so took the opportunity to have a browse in the Palace shop – there is always something that will make a nice gift or just one more post card even. A stroll back to the cars and we headed for Sturdy’s Castle for lunch – and what a pleasant surprise that was, we had excellent pub fare, good value good wholesome food at reasonable prices. We will return there for sure as we were offered a discount for our next visit!